I haven't had a sloppy joe in, oh...I don't know...decades? But recently I got to eat one...and it was so tasty!! I think I'll have to start making it myself! I loved the idea that we were eating sloppy joe's so much, that I wanted to "flip" it and share it with you guys! This is a fun, inexpensive, super easy meal to prepare for yourself or your family and friends! It is definitely something that makes everyone reminisce about the "old days"! Here's a close up! The melted cheese was like the "glue" that kind of held the meat together so it wasn't falling out all over the place. We used shredded mexican cheese and used seasoning salt on our extra crispy Ore Ida fries. Check out the inside of the top of the bun, it was buttery, golden and crisped up! It was huge...and even though I was so full, I still ate the whole thing! 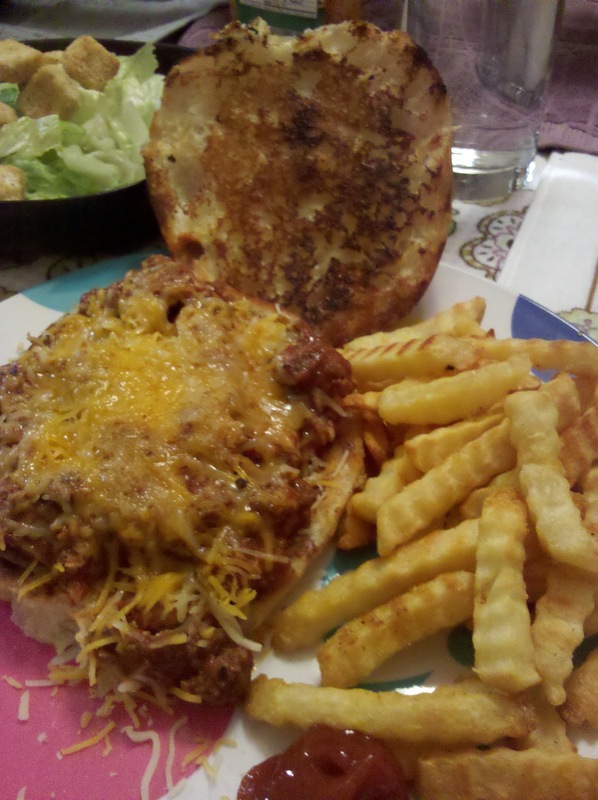 Seriously, I haven't thought about sloppy joe's in forever, and after having it at Stephanie's I just thought what a great thing for people to prepare at home. What's even better is that you can totally make it your own! Use turkey if you don't want to use fatty beef (hmmm...fatty beef), make it with veggie meat if you're a vegetarian (Esther, you know what veggie meat I'm talking about)...or whatever else you can think of...buffalo meat?! 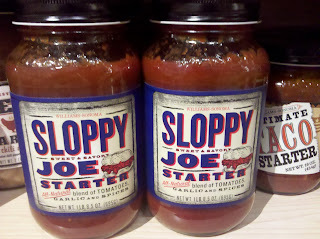 You can buy the sloppy joe seasoning mix, make your own blend or buy a jar...whatever your fancy. Thank you Stephanie for re-introducing this back to me!